Creative CakeWorks: Happy Hayden Day! This was Hayden's first reaction when she saw the birthday cake I made her today. I know she looks a little scared, but she really was excited! You see, she had drawn me FIVE different cake designs for her birthday, and finally settled on this one. 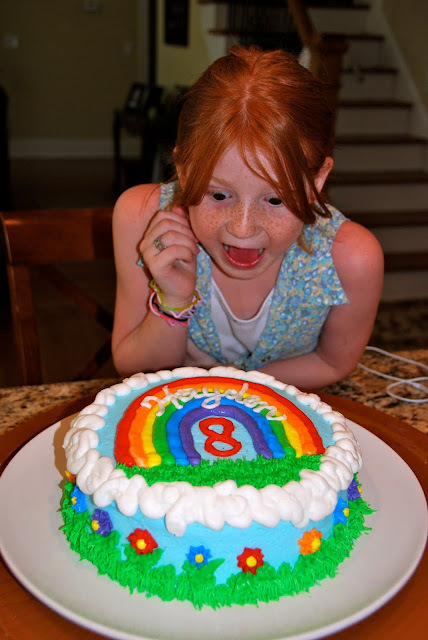 It was a tough choice, because she had a theatre cake, an artist's palette cake, a fashion designer cake, a dressing room door cake, and the rainbow cake. The cake itself is chocolate fudge cake with Nutella filling. If you know Hayden, you know she is a Nutella FANATIC! So, she was in heaven! Hayden liked this cake so much, she said she wants to use it as a design to redecorate her room! Uh-oh!